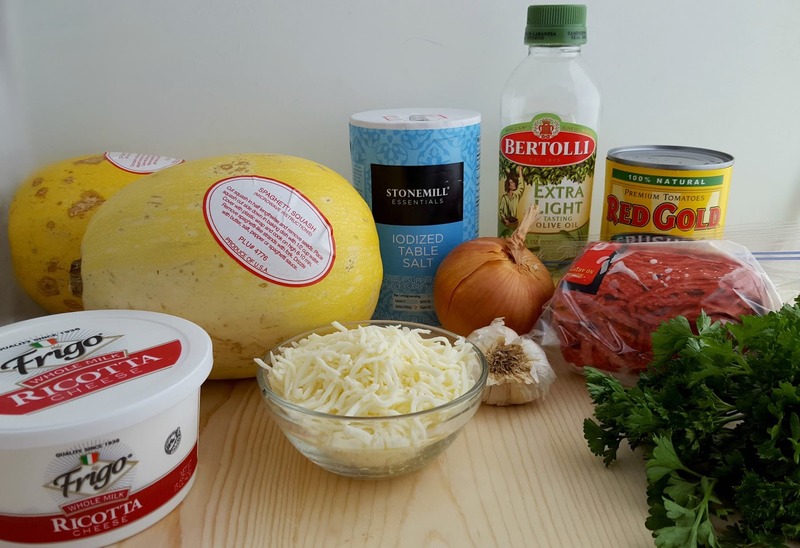 This Lasagna Stuffed Spaghetti Squash recipe is so easy to make and is perfect for those of you who are trying to stay away from carbs. I know a lot of people are all about that KETO life, but I can’t handle that kind of commitment. I don’t like to latch onto a term. Instead, I just make recipes that I love and lighten up on carbs when I can. 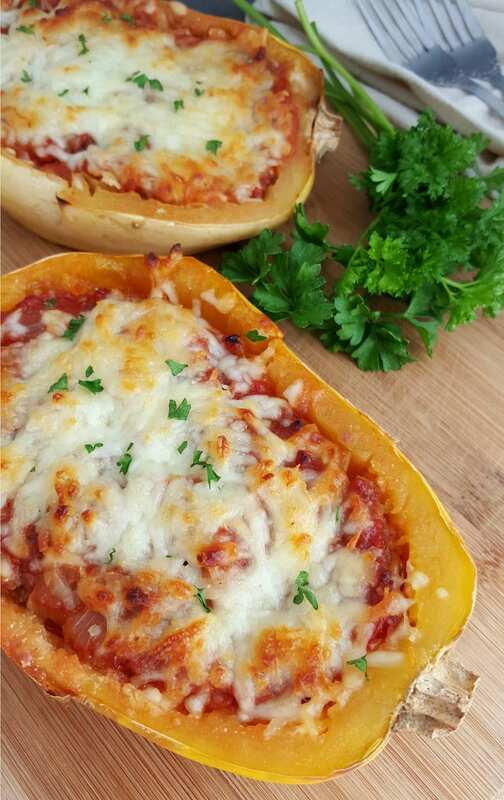 My Lasagna Stuffed Spaghetti Squash recipe will help you in this department. It gives you everything that you want from a lasagna … minus the noodles. So, you will get the delicious tastes from the sauces and the cheese mixture without the starch overload. Ok, let me show you how to make it – let’s get started. 1. Preheat oven to 400 degrees F. Cut the squashes in half long ways and scoop out the seeds. Lay them cut-side down in a roasting pan or other baking dish, and add approximately one inch of water. Roast for 45-60 minutes, until soft when poked with a fork. 2. While the squash is roasting, warm the olive oil in a high-sided skillet or saucepan over medium-high heat. Stir in the onions and cook until translucent, approximately 5 minutes. Stir in the garlic and cook until fragrant, 30 seconds. Add the ground beef and 1 teaspoon of salt. Cook until well-browned, approximately 5-8 minutes. Stir in the crushed tomatoes and bring to a simmer. Continue simmering the sauce until the squashes are ready, 5-20 minutes. Taste the sauce and add more salt if desired. 3. Use a fork to shred the inside of the squash, leaving about a half-inch of squash left in the shell. Mix the shredded squash into the tomato sauce. In a separate bowl, mix together the ricotta cheese, parsley, and ½ teaspoon of salt. 4. Wipe out the roasting pan and arrange the squash shells inside, like bowls. Use a spoon to spread ½ cup of the ricotta evenly over bottom of each shell. Spoon a ¼ of the tomato-squash mixture of the top of the ricotta. Top with another layer of ricotta and tomato sauce, using the remainder of each. ***If making this recipe in advance, cover the shells at this point with foil and refrigerate for up to 24 hours. Add an extra 10 minutes to the cooking time. 5. Bake shells for 15 minutes at 400 degrees F. Sprinkle the shredded mozzarella over the tops of the squashes and bake for another 15-20 minutes until the cheese is melted. For a more golden top, broil the squashes for up to 2 minutes. 6. Garnish with parsley or basil and serve with a green salad and garlic bread. Leftovers will keep for up to 1 week in the refrigerator. In a 2-quart baking dish, layer 1/3 of the tomato-squash mixture into the dish and top with half of the ricotta. Continue building layers, ending with the last third of the tomato-squash mixture. Bake for 15 minutes, and then sprinkle with mozzarella. Bake for 15-20 minutes, until bubbly. Is Lasagna Stuffed Spaghetti Squash Recipe Keto Free? 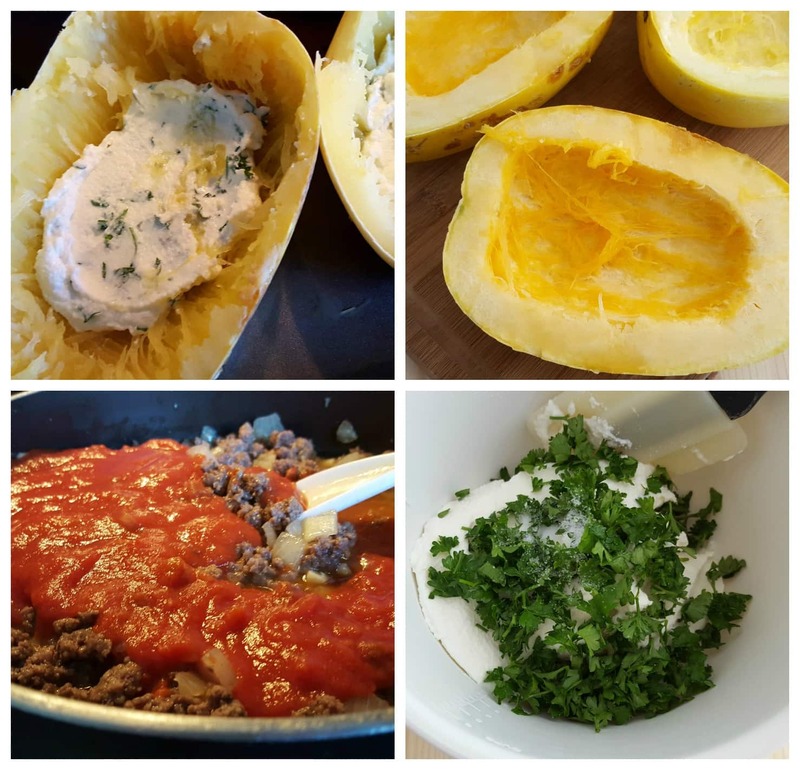 Spaghetti squash does contain some carbs! So, please note this recipe is not KETO FREE. This is a low carb recipe for SURE. If you are on a Keto diet, just be conscious of portion size because it’s not a carb-free food.